There are two ends of the spectrum for foods. The first is those that are considered Health Foods, which we all know about (fresh, ripe, organic fruits and vegetables). No one disputes that fresh fruits and vegetables are considered health foods all over the world, Dr. D.stated. However, no one ever talks about the other end of the spectrum: Death Foods. What are Death Foods? Those are foods that are no longer whole, fresh, ripe, organic fruits and vegetables. Packaged, processed, genetically modified, etc., foods are not Health Foods. They are on the opposite end of the spectrum: they are Death Foods. Dr. D. asked the audience of doctors, "Why would you eat anything other than Health Food "
Quite a few times, Dr. D. pointed out that doctors tend to think they are there to offer health advice to their patients, but they almost always think that they don't need to follow their own advice. Many doctors are not healthy, yet they are offering health advice to those who come to them for help. Who's going to take advice seriously from someone who obviously isn't in great health? "You need to follow your own advice," Dr. D. stressed. "What s the best source of potassium "
"What s the best source of Vitamin C "
"What s the best source of Omega-3 Fatty Acids "
"All your answers were wrong," Dr. D. smiled. They had responded by giving him the highest sources, showing that they had not learned the concept, though they thought they had. He asked what was better: a diet with plenty of Vitamin C-filled fruit, or one where the Vitamin C comes from a pill? No one can argue that fresh, whole, ripe, organic fruits and vegetables are the BEST source for specific nutrients, but they aren't always the HIGHEST source. I heard some things for the first time at that talk. Dr. D. stated that B12 deficiency could be corrected with a water fast and bed rest for one week. It makes sense that if B12 is produced in our intestines that if they are given a break from processing foods, they'd be able to produce the B12 that is required by the body. I don't think I'm up for a week-long fast at this point, but I may try this in the future to correct my B12 deficiency. Another thing that I heard really shocked me. "Fumes of heated cooking oils are carcinogenic." Wow! I knew that eating cooked oils was harmful for our bodies, but the fumes of it I had never even thought about. I'm not exactly sure how they are wording it, but Dr. D. said that California is banning the cooking oil fumes in public places (or something like that). He predicted that the ban will spread across the country because it's now obvious that the fumes are highly carcinogenic. By the end of his talk, everyone in the room had full knowledge that health foods aid the body in health, while cooked and processed foods bring the body further from health. Did this stop the doctors from immediately lining up for a lunch filled with foods from the far end of the spectrum: Death Foods? Not in the least bit. Some of them looked at me as they were standing in the lunch line and said what they thought was funny: "Well, I'm about to go in and get myself some of that Death Food." How was I supposed to respond to that? They were expecting a short chuckle, I'm sure, but I take health and diet seriously. "That's certainly what they're serving: Death Food." All hope was not lost, however. 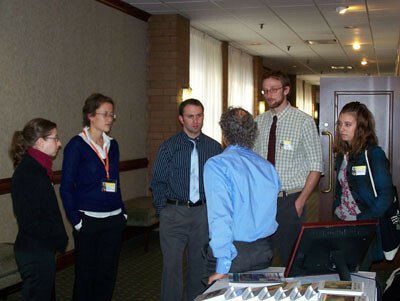 I found it interesting that the younger doctors and interns were drawn to Dr. D. and his message of health and fitness being related to diet.They circled around him, asking question after question, wanting to fully understand this vital piece of health information that they were missing out on in their training to become doctors. Dr. D. was generous with his time, passionately explaining about health to the young people who will one day be asked by their patients: "How do I regain my health, doctor " My hope is that they fully understood Dr. D.'s message and that they'll dive into the field of health, nutrition, and diet. If they do, I don't doubt they'll respond to their patients by saying, "There are two kinds of foods: Health Foods and Death Foods. Why would you eat anything other than Health Food "
I enjoyed spending the day with Dr. D. He's an interesting person and definitely passionate about health, fitness, and diet. I spoke a bit with him about some of the exciting projects I have been working on and he was very supportive and enthusiastic about them. He asked me if I was sure I wanted to get into this world (of spreading the word about a raw food diet and health) after seeing all the work that goes into it (traveling all over the country, or world, toting along products to help spread the message, talking to people who may never follow a health-filled diet, etc.) and I responded: "I have no doubts." I'm a helper, and always have been. I wish someone would have approached me many years ago and told me that there was something better than the vegan diet I was following (which I thought was the ultimate diet, even though it wasn't giving me the health I was desiring). I want to spread the word about raw foods, so that all those people out there trying so hard to be healthy can learn that there really IS a way! 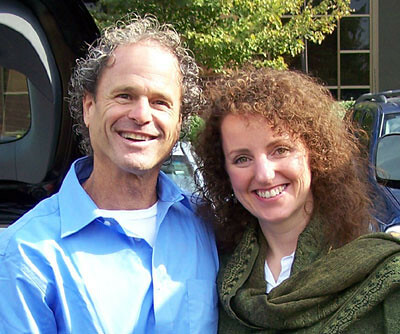 Be sure to check out Dr. Doug Graham's site, which is filled with so much information!! Isn't it the truth that many Americans and not just professional hear all this wonderful positive and truthful information and yet choose the Death food path? So much easier to follow the flock than to be a progressive thinker and doer ... the black proverbial sheep. I am so glad I finally found Health foods after subconsciously knowing that my diet before was not right. I always knew I was missing a piece of the puzzle. I'll be watching for when you are close to my area. Wendi, you are so amazing on so many levels it's hard to keep track. ;) This was such an amazing story! You truly were blessed to be a part of that. Thanks for sharing! Wow! A day with Dr. D! You are blessed! Thanks for the information, it's amazing he was here in Pittsburgh. I wonder why he is only talking to doctors, though? Did I miss a talk he gave that would have been open to all? You are getting more tuned in, turned on, and tapped in as each day passes! You go girl! Awesome, awesome, awesome! Thanks, Faye!! I'm having lots of fun! We keep missing each others' calls. Yes, he was here to only speak with doctors. I don't think there is a recording available. I really enjoyed it and wondered if the doctors fully understood what they were hearing. Most of them seemed dull and lifeless. The younger ones, however, were pretty alert and asking questions!! I am so happy for you, with all that you are doing as far as educating yourself even more in the field of health! I look forward to following what you share about your classes and what you've been learning!! You are always so wise, T! Thanks for your comment. I'll be sure to let you know when I'm near your area! !